What is ‘nature play’? Nature play is a method that uses the landscape and vegetation to bring nature into children’s play environments. There are many reasons why kids aren’t playing outside as much as they used to. Kids today are involved in a lot more structured activities than they used to be, limiting the amount of time for free play outdoors. Also, due to two income families, children are spending more time at after-school programs and daycare centers that are typically more structured environments. Perhaps the simplest way to implement nature play is to fence or rope off a natural area and allow kids (and parents) to explore. In this designated off trail exploration area, there are no rules about staying on the trail or not touching things. Kids can pretend to be an explorer. They can turn over rocks or dig holes to find worms. They can stack sticks to create a fort. The possibilities are limited only by their imaginations. In contrast to conventional playgrounds, children have the opportunity to participate in unstructured, creative playtime. 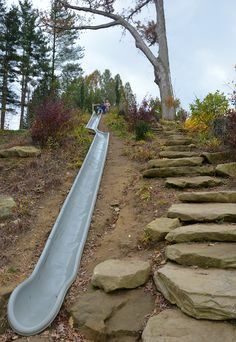 Another type of nature play is similar to a conventional playground except the equipment is constructed primarily of natural materials. For example, boulders could be used as a climbing structure or a balance beam could be made out of logs. A wood framework could be built for kids to add sticks to build walls. In both types of areas, plants can provide more exploration opportunities and interest. Plants with interesting smells and those that attract birds, butterflies and other insects can provide up-close interactions with nature. Children that spend time outdoors feel a greater connection to the environment and want to help protect and preserve it. According to David Orr, “The planet does not need more successful people. But it does desperately need more peacemakers, healers, restorers, storytellers, and lovers of every kind. It needs people who live well in their places…Indoor classes create an illusion that learning only occurs inside four walls, isolated from what students call, without apparent irony, the real world (Orr 2004).” Giving children the opportunity to feel ownership toward their environment, they feel invested in its protection and inherently work toward solving environmental problems. 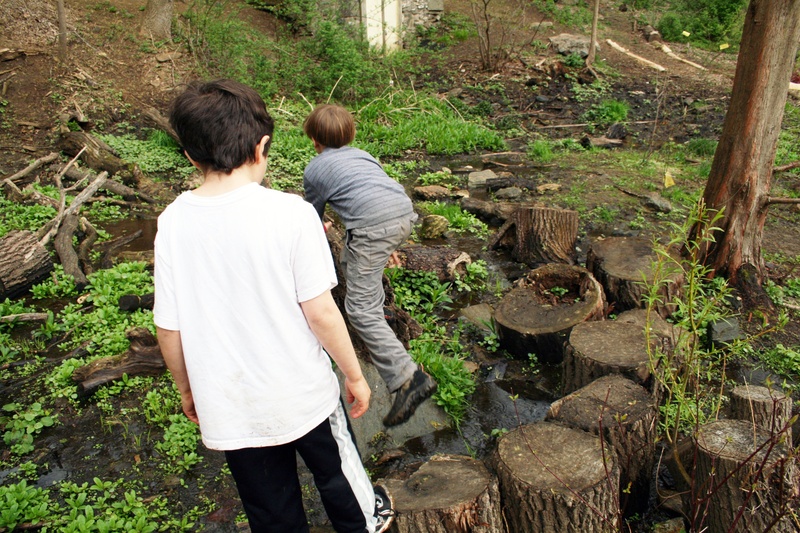 What should be considered in the design of a nature play space? Although construction can be minimal for off-trail exploration areas, some initial investigation of the area and periodic maintenance will be required to ensure there are no obvious hazards such as poison ivy, dangling limbs or sharp branches at eye level. Depending on usage, the area may become trampled over time. The beauty of off-trail exploration areas is that by moving the fence to a new area, an entirely new experience can be created, allowing the previous area to regenerate. 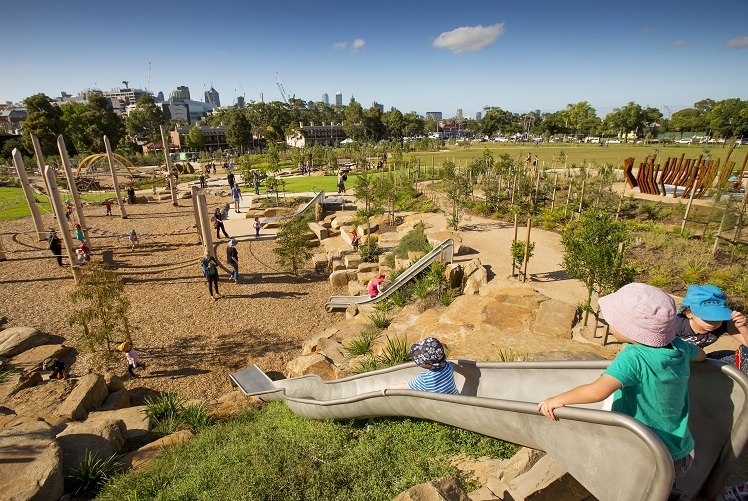 Nature playgrounds require the construction of the play equipment and its ongoing maintenance. If wood is used, it will deteriorate over time and will need to be replaced. Boulders and rock structures need to be inspected to make sure the boulders are stable and secure. As with traditional playgrounds, safety is of utmost importance. If a play space includes items that children interact with with their feet off the ground, safety surfacing is required, as it is for traditional playground equipment. The safety surfacing must be replenished as it is dislodged and as it breaks down over time. By creating off-trail exploration areas and nature play spaces in parks, schools, and daycare centers, we can encourage children to appreciate the world around them and to help protect and preserve it. If you have a vision for a nature play space, Environmental Design Group can help. Send an email to jkerr@envdesigngroup.com for more information.